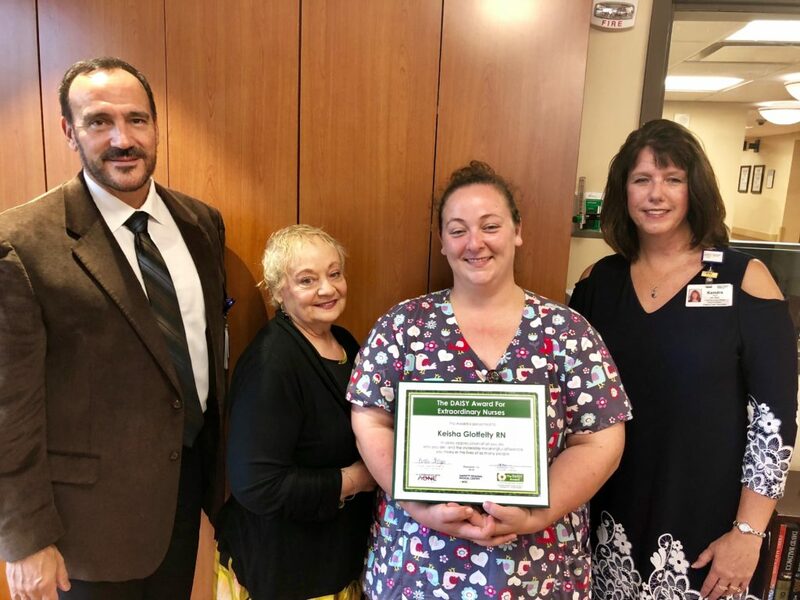 September 13, 2018 (Oakland, MD) – In a special ceremony, Keisha Glotfelty, RN, MS, was announced as Garrett Regional Medical Center’s quarterly recipient of the DAISY Award program for Extraordinary Nurses®. 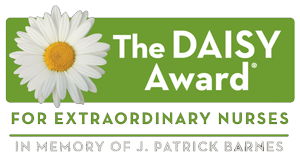 The DAISY Award ceremony took place in the hospital’s Subacute Unit. Left to right: Mark Boucot, CEO & President; Betty Pritt, grandmother of Keisha and longtime Loar Auxiliary volunteer; Keisha Glotfelty, RN and Daisy Award winner; and Kendra Thayer, Senior Vice President and Chief Nursing Officer. The GRMC Subacute Unit is a ten-bed unit designed for patients who require complex care or rehabilitation that often falls between nursing home care and hospital care. The Subacute Rehabilitation Unit was recognized for the fourth year in a row as a Best Nursing Home by U.S. News & World Report, receiving the highest possible overall rating of five stars. The Best Nursing Homes ratings highlight top nursing homes nationwide. Keisha Glotfelty has worked in the Subacute Unit for nearly seven years and originally started as a Geriatric Nursing Assistant. Through GRMC’s Tuition Reimbursement Program, Keisha attended nursing school at Allegany College and became a Registered Nurse in January 2017. 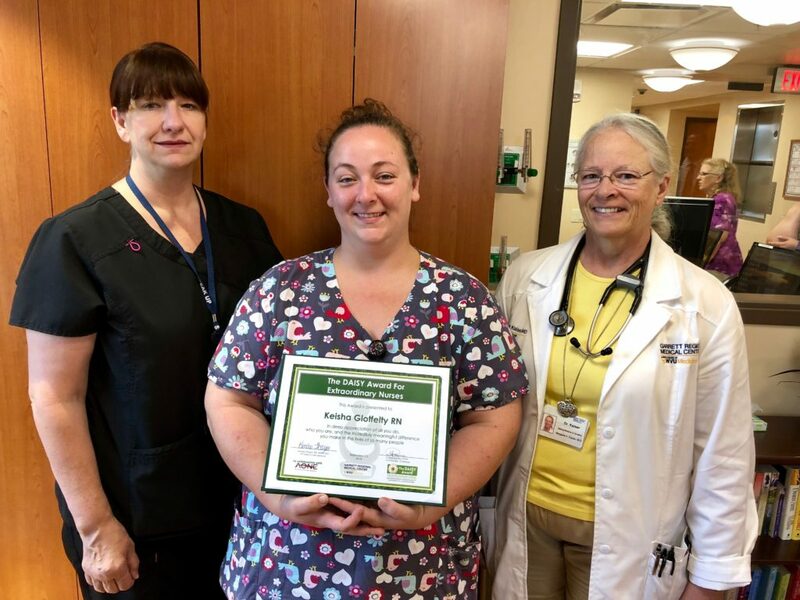 As a DAISY honoree, she received a certificate of commemoration as an “Extraordinary Nurse,” a DAISY Award pin and a sculpture that represents a healer’s touch. A graduate of Southern High School, she resides with her family in Oakland and enjoys spending time with her son. She is also the granddaughter of Betty Pritt, who is a long-time, devoted volunteer at GRMC. Mrs. Pritt is currently a member of the Loar Auxiliary. GRMC will recognized a DAISY recipient on a quarterly basis. Nurses may be nominated by patients, patient families, or colleagues. Forms are available on GRMC’s website at https://www.grmc-wvumedicine.org. Pictured right to left: Lori Davis, RN, Dir. of Subacute; Keisha Glotfelty, RN and Daisy Award winner; Margaret Kaiser, M.D.